In about 776 the Spanish monk Beatus compiled his commentary on the Apocalypse in order to prepare his fellow monks for the end of time. In this world premiere screening, scholar John Williams examines the Beatus tradition, preserved in illustrated examples dating from the tenth to the thirteenth centuries. Their brilliant and provocative illustrations resonate to this day, and will be featured in the film, as will the monasteries that created them. Presented by MUSE Film and Television; Hamid Shams, Director of Photography; music by Rory Boyle. The Morgan's Beatus manuscripts will be on view. There will be a 6 p.m. reception before the screening. *The exhibition The Crusader Bible: A Gothic Masterpiece will be open at 6 p.m. for program attendees. 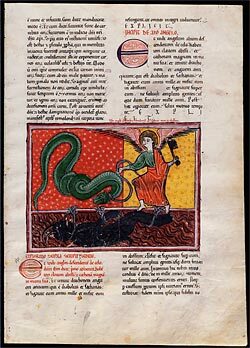 Devil Chained in the Abyss and the Dragon, Beatus of Liébana, Las Huelgas Apocalypse, Spain, 1220, The Pierpont Morgan Library, purchased by Pierpont Morgan, 1910; MS M.429 (fol. 135).